August 30, 2018 -- With the help of MRI, researchers from King's College London found that one dose of the cannabis extract cannabidiol may help reduce abnormal brain function in people with psychosis, according to a study published online on August 29 in JAMA Psychiatry. The researchers analyzed a group of 33 young people who were experiencing distressing psychotic symptoms but had not yet been diagnosed with psychosis. Sixteen subjects received a single dose of cannabidiol, while the other 17 received a placebo. For comparison, the study also included 19 healthy control subjects. 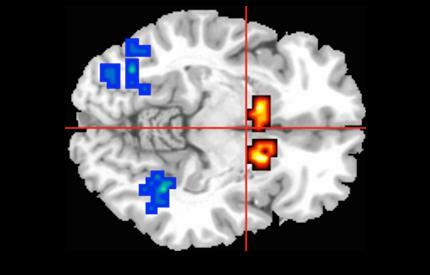 MRI shows activity (red and yellow areas) in the caudate region of the brain, which is affected in people with psychosis. Image courtesy of King's College London. All participants underwent MRI scans while performing a memory task to engage three regions of the brain involved in psychosis. Among those at risk for psychosis, the subjects who were given cannabidiol showed less-severe abnormal brain activity than those who received a placebo, suggesting that cannabidiol can help readjust brain activity to normal levels. The researchers are now launching a large-scale, multicenter trial to determine whether cannabidiol can be beneficial in treating young people at high risk of developing psychosis.